They've saved countless lives as the UK's busiest mountain rescue team. But there is one call-out in their 50-year history that signals the darkest day for Llanberis Mountain Rescue. Four years ago, their friend and founder John Ellis Roberts suffered a cardiac arrest on Snowdon and fell from a cliff. Sadly, he later died. "There are things that you put into the back of your mind and don't want to recall," said vice-chairman John Grisdale. "John was my colleague, but we were also great friends. "I wasn't personally involved when the team was called out to John that day, I'm relieved to say, but I know it was very difficult for the team. There was great sadness. "John's involvement from the beginning was crucial in establishing the team. He was made an honorary member before he died, so we had a chance to say thank you to him." 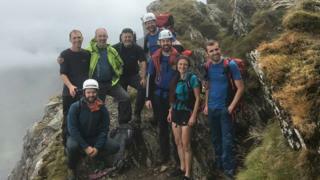 As they mark half a century of Snowdonia rescues, past and present members of the rescue team are gathering at the Victoria Hotel in Llanberis this weekend to share their memories and experiences on their 50th anniversary. Mr Grisdale, 70, has been a member of Llanberis Mountain Rescue for more than 40 years and is still an active member of the team. "The majority of the 200 or more call-outs we get in a year are lower leg injuries, fractures - those are our run-of-the-mill incidents," he said. "However, there are other significant events that crop up less frequently which are more difficult. "If we attend an aircraft crash, it has quite an horrific impact. These are the types of incident that one tries to put to the back of your mind, as they tend to involve fatalities and sometimes this involves children." Getting a call-out can be "daunting", says Mr Grisdale, as "you don't yet know the full nature of whatever you are going to deal with". "You could be going out to a rescue, trying to comfort someone who has seen an horrific accident or breaking the news to someone that someone has died," he said. The responsibilities of being part of a mountain rescue team can require a bit of patience and understanding from the partners and families of the rescuers - who are all volunteers. "Last week I attended a call-out on Sunday, another on the Wednesday, then another two on Friday and Saturday. So I went out four times in just one week. They all take a lot of time," said Mr Grisdale. "We have a lot of gratitude to our partners and families for the times we have to leave to attend an incident when a meal is still on the table. I've even been called out on Christmas Day." The team is mainly reliant on fundraising for equipment to maintain their rescue service, which has seen a 700% increase in call-outs in the past 20 years. "We are seeing quite a growth in incident numbers," said the team's press officer Miles Hill. "There were around 30 incidents a year when it started in 1968 - now it's more than 200 a year and we had more than 40 in August alone this year."